This kit includes all of the parts needed to build the GuitarPCB Tube Screaming Ultra LDO (Landgraff) project. This overdrive is basically a Tubescreamer without the buffer, and will deliver tone similar to the Landgraff Dynamic Overdrive. The circuit board included in this kit can be used to make 2 different (but similar) overdrive circuits, but this kit includes the parts for the “L” build as described in the build document. We may offer a kit that includes the parts for the other build in the future. This kit includes a 125B enclosure and black Aluminum knobs. Landgraff Dynamic Overdrive™ is a trademark of John Landgraff Pedals. Tubescreamer™ is a trademark of Ibanez®. Pedal Parts and Kits is not associated with and makes no claims to these trademarks. See our FAQ for more details. 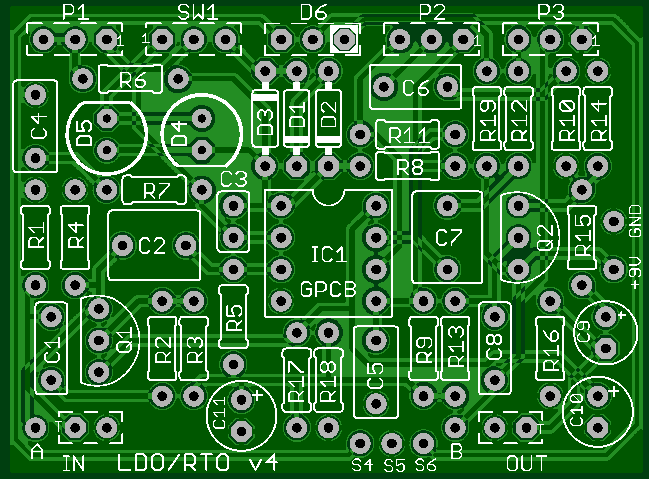 Check out this LDO Audio Demo by Barry at GuitarPCB!